Before you start your flower gardening in containers, ask yourself a few questions. Are you looking for one large pot in which to plant a variety of mixed flowers or are you thinking of planting individual flowers in many smaller individual containers? Do you want to be able to rearrange your container garden on a whim if you get tired of the same old arrangement? Do you want to throw in some hanging plants instead of just having stationary containers? What is your purpose in undertaking flower gardening in containers? What kind of visual expression are you trying to achieve? Do you want small plants or large ones? It's true that almost anything will grow in a container, but if you're going for the mixed container option, you must be very careful in choosing the plants to house together. For example, strawberry plants are not that aggressive when it comes to competing for water and nutrients and may do very poorly in a container with a more aggressive plant. As a general rule, you should choose plants that have similar characteristics and needs, when putting more than one plant in the same container. And make sure each plant has the space that it needs. While almost every flower will adapt to growing in a container, you will need to provide it with the light (especially indoors), soil, water, nutrients, and care that it requires. You may need to add a grow light (which you can purchase at your local garden supply store) for flowers needing full sun, while flowers that only need indirect light will do well in a window space. Do not use plain garden soil when flower gardening in containers because it will eventually turn into compacted rock-hard soil through which roots cannot grow. Sterilized potting mix, prepared potting soil, or soil-less potting mixture, which can be purchased at any nursery, are all viable options. If you feel that the prepared mixture can do with a little extra organic matter, add some peat moss. Some plants, like orchids and African violets, will require special potting mixtures, so make sure you understand the individual needs of your container garden inhabitants. Obviously, as enthusiastic as you are now about your new flower gardening in containers hobby, be realistic about the amount of time you will actually be able to spend on caring for your container garden. African violets are relatively easy to grow, but exotic plants like the bird of paradise are quite high maintenance. Once you're sure you can meet your plants' needs, get started on designing your container flower garden. Don't consider the containers as just a place to plant flowers, but rather as part of the visual appeal of your new garden. Try clustering containers together, or separating them into strategic locations. Place containers on wooden benches or on other, upside-down containers. 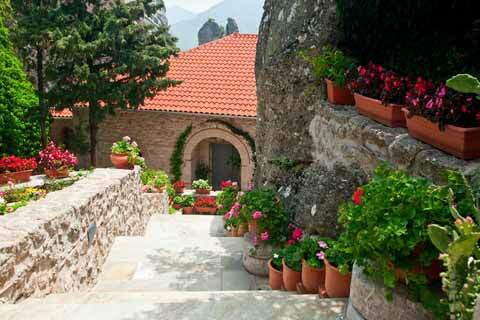 Line a bland stairway with small containers of colorful flowers, or brighten up your window with window boxes. To start, place a layer of rocks or chipped wood at the bottom of your container (again, this will help with drainage and may be a better solution than drainage holes, which may cause soil loss). Then add your soil mixture (with organic matter) and a good fertilizer. Don't fill the container to the top just yet; stop at the level where you'd like the roots of your plant to sit. Take your plant and sit the root ball on the soil; then add more soil mixture to fill in around the roots. Stop at about one inch from the top of the container. 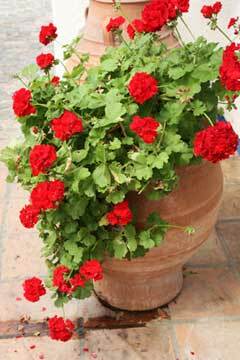 Add a plentiful amount of water to the container immediately after planting. To keep the soil from drying out, you can add pebbles, or dried moss around the base of the plant. Good plants to use for your flower gardening in containers hobby can be tender perennials and non-hardy plants; things like asters, lantana, coleus, and delicate bulbs can work well. Annuals are wonderful for container gardens because you don't have to worry about winter conditions and they provide instant, consistent color. As far as maintenance, since the soil in containers dries out quickly (because it's lighter and fast-draining), you'll need to water container gardens more often. They also require more feeding. Since plants don't grow naturally in containers, you'll need to provide them with all their needs. If you take care of them, though, container gardens will provide you with amazing displays of beauty and nature at your fingertips; they can brighten up your living space and lift your spirits.